Healthy Chicken Tenders Recipe Crusted with Gluten Free Chex! There’s nothing like a good chicken tenders recipe! Especially when you can no longer buy store bought or run through fast food. Plus homemade is so much better, delicious and easy! How do you make your batter when you have common food allergies including; egg allergies, dairy allergies, and a wheat allergy? Before receiving a second allergy test that showed a slight sunflower allergy, we would crumble up sweet potato chips and use that as a crust. Unfortunately almost every chip out there has an ingredient of sunflower and/or safflower oil. Luckily we came across Gluten Free Rice Chex, and that opened up some new possibilities! My nephew loves Rice Chex by themselves as a snack. Note: I used frozen chicken for this recipe and boiled in water with 1 tbl lemon for approx 15-20 mins. Boil until mostly cooked, it's okay to leave a little under cooked (if you use fresh chicken, lengthen the baking time below, no need to boil. Once boiled allow to cool for a minute and then cut chicken into thin strips. Place Chex in a bag and crush until all whole pieces are broken up, add seasonings and shake bag to mix. Get out two bowls or pie pans and place flour in one and milk in the other and a plate for the crushed Chex. Dip the strips of chicken into flour evenly coat, then into milk evenly coat, and then dip into Chex mixture until the chicken is coated. Place coated chicken into greased pan. Once all chicken is coated place pan into the oven and bake at 400 for 15-20 mins until cooked and lightly golden brown. 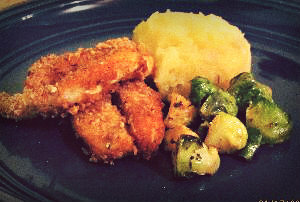 I served this healthy baked chicken recipe alongside baked brussel sprouts and a sweet potato. Return From Chicken Tenders Recipe to Food Allergies Home Page!